This Cheyenne war chief was a contemporary of Dull Knife. He was not so strong a character as the other, and was inclined to be pompous and boastful; but with all this he was a true type of Native American in spirit and bravery. While Dull Knife was noted in warfare among Indians, Roman Nose made his record against the whites, in defense of territory embracing the Republican and Arickaree rivers. He was killed on the latter river in 1868, in the celebrated battle with General Forsythe. Save Chief Gall and Washakie in the prime of their manhood, this chief had no peer in bodily perfection and masterful personality. No Greek or Roman gymnast was ever a finer model of physical beauty and power. He thrilled his men to frenzied action when he came upon the field. It was said of him that he sacrificed more youths by his personal influence in battle than any other leader, being very reckless himself in grand-stand charges. He was killed needlessly in this manner. Roman Nose always rode an uncommonly fine, spirited horse, and with his war bonnet and other paraphernalia gave a wonderful exhibition. The Indians used to say that the soldiers must gaze at him rather than aim at him, as they so seldom hit him even when running the gantlet before a firing line. He did a remarkable thing once when on a one-arrow-to-kill buffalo hunt with his brother-in-law. His companion had selected his animal and drew so powerfully on his sinew bowstring that it broke. Roman Nose had killed his own cow and was whipping up close to the other when the misfortune occurred. Both horses were going at full speed and the arrow jerked up in the air. Roman Nose caught it and shot the cow for him. Another curious story told of him is to the effect that he had an intimate Sioux friend who was courting a Cheyenne girl, but without success. As the wooing of both Sioux and Cheyenne was pretty much all effected in the night time, Roman Nose told his friend to let him do the courting for him. 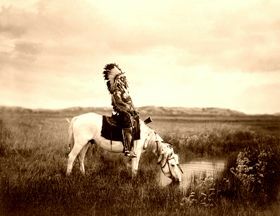 He arranged with the young woman to elope the next night and to spend the honeymoon among his Sioux friends. He then told his friend what to do. 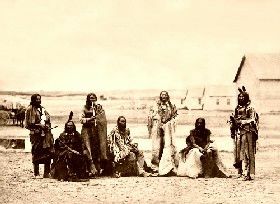 The Sioux followed instructions and carried off the Cheyenne maid, and not until morning did she discover her mistake. It is said she never admitted it, and that the two lived happily together to a good old age, so perhaps there was no mistake after all. When the Northern Cheyenne under this daring leader attacked a body of scouting troops under the brilliant officer General Forsythe, Roman Nose thought that he had a comparatively easy task. The first onset failed, and the command entrenched itself on a little island. The wily chief thought he could stampede them and urged on his braves with the declaration that the first to reach the island should be entitled to wear a trailing war bonnet. Nevertheless he was disappointed, and his men received such a warm reception that none succeeded in reaching it. In order to inspire them to desperate deeds he had led them in person, and with him that meant victory or death. According to the army accounts, it was a thrilling moment, and might well have proved disastrous to the Forsythe command, whose leader was wounded and helpless. The danger was acute until Roman Nose fell, and even then his lieutenants were bent upon crossing at any cost, but some of the older chiefs prevailed upon them to withdraw. Ogalala Sioux at an oasis in the Badlands. Thus the brilliant war chief of the Cheyenne came to his death. If he had lived until 1876, Sitting Bull would have had another bold ally. Written by Charles A. Eastman, 1918. Compiled and edited by Kathy Weiser/Legends of America, updated April, 2017. About the Author: Excerpted from the book Indian Heroes and Great Chieftains, by Charles A. Eastman, 1918. (now in the public domain). Charles A. Eastman earned a medical degree from Boston University School of Medicine in 1890, and then began working for the Office of Indian Affairs later that year. He worked at the Pine Ridge Agency, South Dakota, and was an eyewitness to both events leading up to and following the Wounded Knee Massacre of December 29, 1890. Himself part-Sioux, he knew many of the people about whom he wrote.